Akashagarbha (Skt. Ākāśagarbha; Tib. ནམ་མཁའི་སྙིང་པོ་, Namkhé Nyingpo, Wyl. 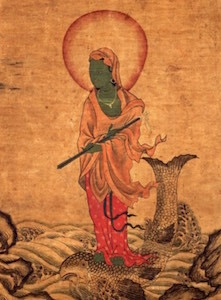 nam mkha'i snying po) — one of the eight great bodhisattvas. The name means 'nucleus of space.' Akashagarbha is associated with the element of space (Skt. ākāśa), as well as wisdom and knowledge similar to Mañjushri. He is often depicted as blue, yellow or green in colour and holding a sword to cut through the destructive emotions. This page was last edited on 9 February 2019, at 12:36.